Maybe you can get a spot in the audience in one of the known talk shows broadcasted from New York! For sure, you have seen any of the many American talk shows on television. 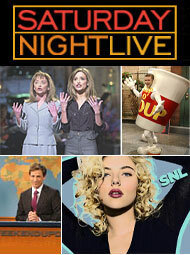 You have "The Late Show", "Late Night" and "Saturday Night Live" and more. For you who like these shows might become one in the audience. Go to a FREE TV-screening! Each show offers you as a New York visitor the opportunity to come as a viewer for free during recordings and all have, of course, their own way to offer you their free tickets. We list some of the talk shows sent from New York below. Look at their websites how to get hold of tickets. None of the TV shows can guarantee you a seat!! Seth Meyers took over the Late Night in 2014 by Jimmy Fallon. Jimmy had been the host between the years 2009-2014. Those were the hosts were formerly Conan O'Brian between the years 1993-2009 and 1982-1993 David Letterman. Bild: Från Late Night with Seth Meyers hemsida. One of the most famous talk shows that have been recorded in New York is maybe (The Late Show) who had David Letterman as host. The program started in 1993 and David finished as host May 20, 2015. 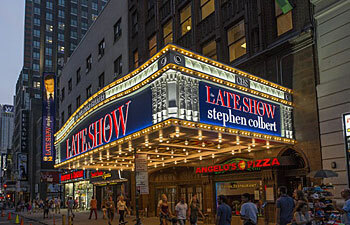 Stephen Colbert took over as host in autumn 2015.
hosting the program "Late Night with David Letterman" which ran for about 11 years. So David Letterman is considered the most famous talk show host for Johnny Carson for 30 years, the program "The Tonight Show." The Show is sent by CBS from " The Ed Sullivan Theater"
The comedy TV show which started in 1975. Here humorous sketches are mixed with good music. Several of the most famous American comedians started there career here as among others Chevy Chase, Dan Aykroyd, Eddie Murphy and Billy Crystal. Each show has it´s special host which often is a well-known person. Previous hosts have been Justin Timberlake, Robert DeNiro, Christopher Walken, Drew Barrymore and Scarlett Johansson and many many more. You will get to see a different side of the hosts that you may not be used to seeing. Picture: Saturday Night Lives website. Pictures: The pictures above is collage from the tv-shows websites.